You can find out everything you need from their site but here are some of the things I’ve learned about Blurb over the last 3 years. The quality of the printing is excellent especially if you go for the double weight paper. That said I hardly ever do! The reason being that I print 50 or so copies at a time and I want to keep costs down but anyone who wishes to donate a book to someone the heavy weight paper is a must. A book is a great PR tool and what’s more can be constantly updated. In the old, pre-digital days you would have to have printed hundreds if not thousands of copies of a book to keep the individual costs down but the printing bill was huge. I print usually ten big books and 50 small ones. More than ten you get a discount. When I have new pictures I bring out a new book and call it a new limited edition. The software Blurb provides free is easy to use and intuitive even for someone with no page-making experience. That said you can use InDesign which has considerable advantages especially if you are thinking of turning your Blurb book into a ‘real’ book at a later date. The price goes up by about 20% when you exceed multiples of 40 pages. I seek to keep my books within 80 pages. If you print on heavyweight paper your book will be a lot thicker. My biggest sellers are the softcover 18x18cm books, 80 pages, normal paper, 10 copies: £11 each plus VAT (tax) if applicable, and postage. Don’t forget to save your photos in sRGB before you import them into Blurb. If you don’t the result will be washed out, de-saturated pictures. You can import any unusual type face you may have acquired into Blurb over and above the scores they already have. You can also use not Latin type faces like Arabic. Once you’ve produced a book they’ll inform you from time to time of their special offers such as: free delivery, double weight paper for the price of single, and even 15% discounts. Blurb do not as yet provide ISDN numbers although you can add your own. You can’t sell on Amazon, Book Depository etc without one. 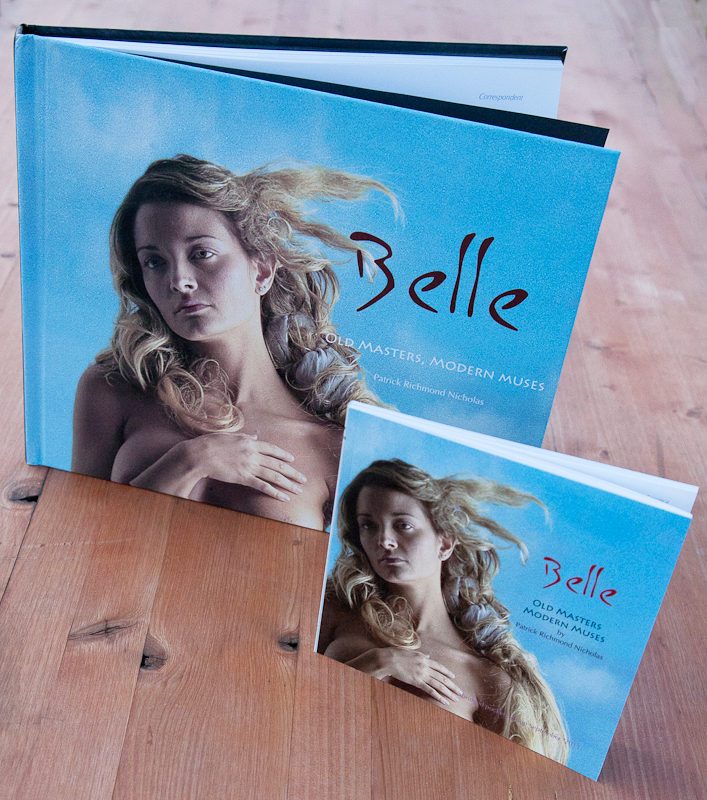 My books are Belle here, and landscape photography Tuscia here. 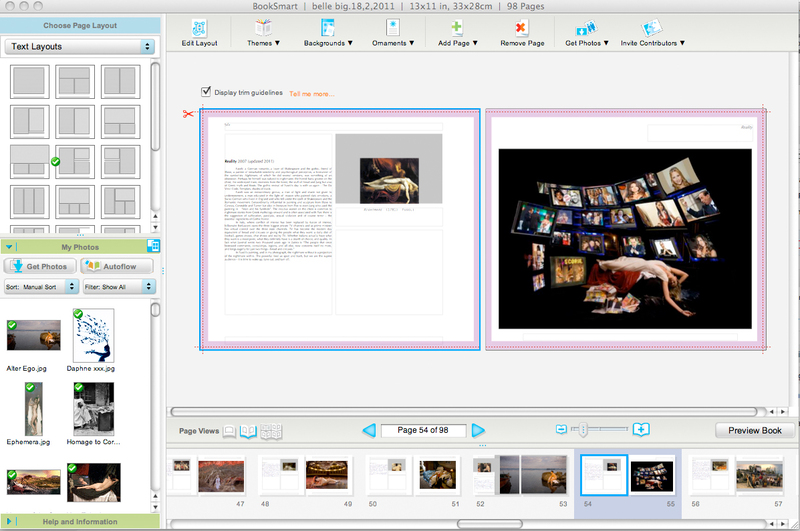 You can preview the complete book which is another nice feature. The Blurb page making interface. It's easy and intuitive. Change book sizes – Take your existing Small Square book, click “Change Size” and make it a Large Square book. BookSmart copies the entire contents of your book into the new book size and saves your original version so you can always order more. Create gorgeous two-page spreads automatically – Just drop your photo in our new two-page template and BookSmart automatically spans your photo across two pages with full bleed. No manual adjusting needed. PS Ihave just heard of a new on-line publisher, Photobox.com Check them out and tell me what you think.